Everyone loves this fabric. The comforter is soft and warm, perfect match for our bedroom renovation. I would definitely recommend this comforter. The price is very fair . Modernize your guest room bedding with this 8-piece set from Copper Grove. Made from microfiber and polyester fill, the plush comforter features a geometric wave print in shades of grey, beige, and blue. Complete your look with the included sheets and decorative bed skirt and shams. Horrible. Do Not Buy This! We purchased this bed set, received it and immediately washed it, per the instructions on the tag. When we pulled it out of the wash it was thrashed! Completely fell apart. Aside from being horrible quality, the blanket wasn't even a true King. It was way too small. Spend your money elsewhere. Nice, great colors but not long enough at the foot of the bed. Sheets are super soft. The comforter, bedskirt, and shams were all great. I just found the sheets and pillowcases a little flimsy for my liking. The fitted sheet literally came apart in the corner as I was making up the bed. I was scared putting the pillows in the cases, as I hadn't put very much pressure on the sheet. At least the comforter seems okay. This comforter is the cheapest material imagineable. We expected a soft fluffy comforter and this is the thinnest roughest material. We expect a comforter to be a top blanket but the filler material inside is so thin and light weight that you can barely feel anything on top when you crawl in bed. Speaking of the quality of comforter, the instructions say wash cold water and dry on low. We washed according to these instructions and draped it over a drying rack rather than chancing it shrinking in the drier and found the material inside bunching up to the point it was pulling threads in each end making it look like a fitted sheet to an extent. Pulling the bunched ends apart you could hear threads inside breaking and the inner material will not fill the corners anymore. 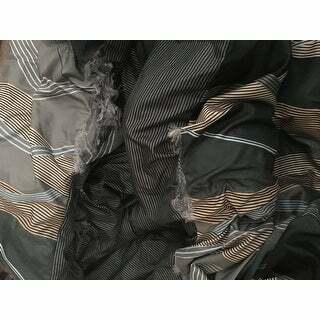 I don't recommend buying a comforter every again over the internet unless you are familiar with that manufacturer. I usually pretty understanding and give good reviews but this is a waste of money! Loved the bedding, the sheets were a bonus, but of low quality, after a few washes lots of piling so I replaced the sheets. the blanket isn't long enough. when we roll over the other person loses the cove. the sheets are very thin and they constantly come off the corners. This set matched perfectly with my sons room which is hunter green on the walls with a tan rug. It is exactly as described. The sheets and pillow cases are lightweight and soft. The comforter is your typical polyfill comforter. To get an entire set for the price was great. I would recommend. Sheet set is very poor quality. The sheets pill and very sheer. The comforter is very nice. I wound up discarding the sheets after 3 washes. I love the design and almost everything about this bed-in-a bag for my guest room. However, it's around 3" too short side to side and does not fully cover the top mattress allowing the sheets to show. I'm wondering if a light weight black blanket that covers the sheets would work. Otherwise I'll have to order a queen size and donate all the extra pieces. Or, I guess I could pack it up, return it and order the queen size. Color, quality, best price. What more could you ask for? The sheet set is very thin. I don’t think they’ll last after a few washings. The comforter colors are great, but is already fading after just 3 washings. I’m using this set in a remodeled nautical guest bedroom. I’m already looking to replace it due to fading. The colors were perfect, and the comforter is light enough to be able to move on the bed. The pillows were the perfect contrast to the comforter....brought out the contract perfectly. I really like this set. Looks great in the new guest room. Everything was just as described in the listing. Great quality, comfortable and seems durable. Shipping was very fast especially considering it was holiday season! Very pleased! Will order again! Nice set for a good price. I've washed this several times now and it still looks like new. The sheets are poor quality. I would have liked accent pillows as an option to the sheets. I like the style of the comforter and the fabric. It looks great in my guest room. It had beautiful color and design and was on sale. "What color is the sheet set? Is that a white or light gray or some other color?"